The primacy of Peter is one of the hardest of things for non-Catholic Christians to accept. Many of these people will tell you that that the Peter did not hold a primacy in the church at all. In this post, I will give some quotes from the Fathers of the Church that support the primacy of the Peter. “[T]he blessed Peter, the chosen, the preeminent, the first among the disciples, for whom alone with himself the Savior paid the tribute [Matt. 17:27], quickly gasped and understood their meaning. And what does he say? ‘Behold, we have left all and have followed you’ [Matt. 19:27; Mark 10:28]” (Who Is the Rich Man That Is Saved? 21:3–5 [A.D. 200]). “[T]he Lord said to Peter, ‘On this rock I will build my Church, I have given you the keys of the kingdom of heaven [and] whatever you shall have bound or loosed on earth will be bound or loosed in heaven’ [Matt. 16:18–19]. . . . Upon you, he says, I will build my Church; and I will give to you the keys, not to the Church” (Modesty 21:9–10 [A.D. 220]). “Be it known to you, my lord, that Simon [Peter], who, for the sake of the true faith, and the most sure foundation of his doctrine, was set apart to be the foundation of the Church, and for this end was by Jesus himself, with his truthful mouth, named Peter, the first fruits of our Lord, the first of the apostles; to whom first the Father revealed the Son; whom the Christ, with good reason, blessed; the called, and elect” (Letter of Clement to James 2 [A.D. 221]). “Likewise it is decreed . . . that it ought to be announced that . . . the holy Roman Church has been placed at the forefront not by the conciliar decisions of other churches, but has received the primacy by the evangelic voice of our Lord and Savior, who says: ‘You are Peter, and upon this rock I will build my Church, and the gates of hell will not prevail against it; and I will give to you the keys of the kingdom of heaven . . . ’ [Matt. 16:18–19]. The first see, therefore, is that of Peter the apostle, that of the Roman Church, which has neither stain nor blemish nor anything like it” (Decree of Damasus 3 [A.D. 382]). “Although bishops have a common dignity, they are not all of the same rank. Even among the most blessed apostles, though they were alike in honor, there was a certain distinction of power. 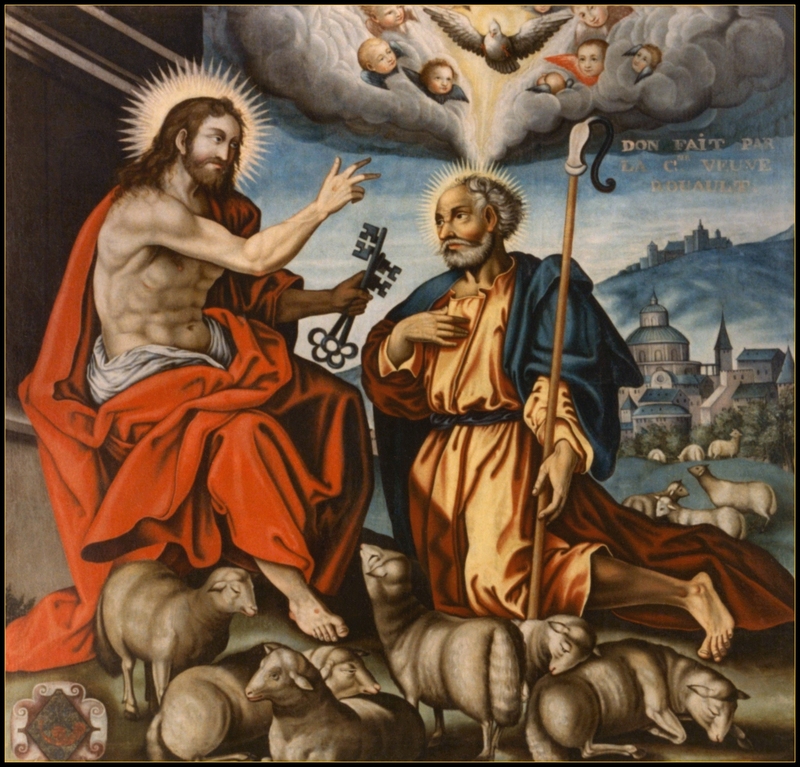 All were equal in being chosen, but it was given to one to be preeminent over the others. . . . [So today through the bishops] the care of the universal Church would converge in the one See of Peter, and nothing should ever be at odds with this head” (ibid., 14:11). These are just a small amount of many quotes of the Church Fathers that support Peter’s Primacy over the other Apostles. These quotes clearly indicate that the primacy of the Pope was not invented as some say but was held by the church since the beginning. Thanks to churchfathers.org for the quotes.